OVER LUNCH with Roger Stone, perhaps the most colourful adviser to Donald Trump’s 2016 presidential campaign, the stories flow faster and are more intoxicating than wine. For a race he worked on early in his career, in his home state of Connecticut, he and other volunteers worked the platforms at a commuter rail station, passing out flyers with hot coffee in the mornings and freshly mixed martinis when the passengers returned in the evenings. Other anecdotes are more baroque: conspiracy theories about CIA drug smuggling, reconstructions of private conversations between Ross Perot and George H.W. Bush, a tale about Joe Biden trying to cut to the front of the dinner line at a casino in Delaware. Asked if he was worried about Robert Mueller, the special counsel charged with investigating links between Russia and Mr Trump’s campaign, he scoffed: “Worry? I don’t worry. 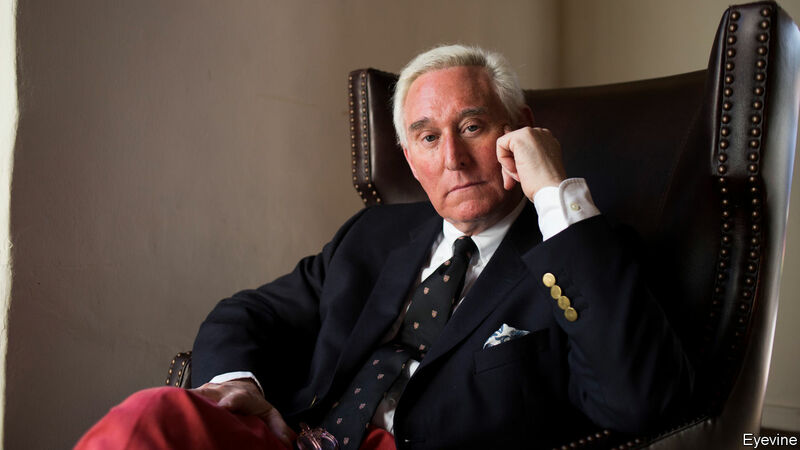 I make other people worry.” But that was in December; Mr Stone’s bravado may have dropped a notch or two since his arrest on January 25th at his home in Fort Lauderdale. The special counsel’s office unsealed a seven-count indictment filed in Washington, DC charging Mr Stone with obstructing an official proceeding, witness tampering, and making false statements regarding his communication with Wikileaks and the Trump campaign. The Mueller investigation was set up to look at “links and coordination” between the Russian government and the Trump campaign. Many of the links have already been revealed in indictments, but coordination has proved more elusive. Mr Stone, who both worked on the campaign for a while and seemed to have advance knowledge of the emails allegedly stolen from the Democratic National Committee by the Russian military intelligence (the GRU) looked like he might be the missing link, which is why Mueller-watchers have been waiting for his indictment so eagerly. As with the other indictments handed out by the special counsel’s office, this one is well worth reading. It alleges that in June and July of 2016, after his official role with the campaign had ended, Mr Stone “informed senior Trump campaign officials that he had information indicating [Wikileaks] had documents whose release would be damaging to the Clinton campaign.” Wikileaks released its first batch of emails on July 22nd; four days later, Mr Trump had nearly erased Hillary Clinton’s polling lead. After that release, “a senior Trump Campaign official” allegedly “was directed to contact STONE about any additional releases and what other damaging information [Wikileaks] had regarding the Clinton campaign. STONE thereafter told the Trump Campaign about potential future releases of damaging material by [Wikileaks].” The indictment names neither the senior campaign official nor the person who “directed” him or her to contact Mr Stone. According to emails published by the New York Times, Messrs Stone and Bannon exchanged emails about Wikileaks in early October. Over lunch in December, Mr Stone offered a lawyerly, expansive defence of his conduct. “There’s no evidence, or proof, and no one can honestly say that I had advance notice of the source, or the content or the exact release date of the Wikileaks material either stolen—or I should say, allegedly stolen and allegedly hacked.” The word “exact” in that sentence is doing a great deal of work. Mr Stone says that his subsequent testimony before the House Intelligence Committee, another possible source of legal trouble for him, was “completely accurate and truthful,” and that “any discrepancy in my testimony would be immaterial.” The indictment alleges otherwise. The committee asked Mr Stone whether he had any documents “concerning…discussions you have had with third parties about” Julian Assange, the head of Wikileaks. Mr Stone replied that he did not. The indictment alleges that he had multiple emails and text messages about Mr Assange, including one to a Trump campaign supporter from October 3rd 2016 that read, “Spoke to my friend in London last night [presumably Mr Assange, who lives at the Ecuadorian embassy in London]. The payload is still coming.” Four days later, Wikileaks released thousands of emails allegedly stolen from John Podesta, Mrs Clinton’s campaign chair. The indictment further alleges that he made several other false statements to the committee regarding the nature of his communication with intermediaries in direct contact with Mr Assange, and with Mr Trump’s campaign. The witness-tampering charge stems from his alleged attempts to prevent one of those intermediaries from contradicting his testimony—which he did in the colourful mafia-style language beloved of Mr Trump and his associates. Mr Stone advised the witness to “Stonewall it. Plead the fifth,” and later, “I’m not talking to the FBI and if your [sic] smart you won’t either.” When the intermediary proved less tractable than Mr Stone would have liked, Mr Stone called him “a rat. A stoolie. You backstab your friends-run your mouth. My lawyers are dying Rip you to shreds [sic].” He also threatened the intermediary’s pet dog, and told him to “Prepare to die”. Jay Sekulow, one of Mr Trump’s attorneys, says that Mr Stone’s indictment “does not allege Russian collusion by Roger Stone or anyone else. Rather, the indictment focuses on alleged false statements to Congress.” This is also less than fully true: the false statements concern contacts with Wikileaks, which America’s own intelligence services say is a conduit for Russian intelligence. As for Mr Stone, he descended the courthouse steps after his release on a $250,000 bond with his arm outstretched, flashing a “v” sign in the style of his earliest political hero, Richard Nixon. He told the gathered journalists and onlookers that he intended to plead not guilty, and that any false statements he made in his testimony were “both immaterial and without intent.” He said he was one of Mr Trump’s “oldest friends” and vowed not to testify against him. He will appear in federal court in Washington next week to formally answer the charges. Before talking to the mainstream media, however, he gave an interview to Alex Jones, a prominent conspiracy theorist who has promoted the line, among other false claims, that no children died in a school shooting in Sandy Hook, Connecticut; and that high-ranking Democrats trafficked children from the basement of a pizza restaurant in Washington, DC. Mr Stone insists that he does not agree with Mr Jones about everything, but, he says: “You have to understand: to us CNN is a conspiracy theory. MSNBC is a conspiracy theory.” That is a nifty talking point. But at some point truth matters. Mr Stone will soon have to defend his claims not on television, but from the witness stand, where the penalty for lying is imprisonment.